Fourth Row Center: Film Writings by Jason Bailey: On DVD: "Yonkers Joe"
Robert Celestino’s Yonkers Joe has enough material for two movies, and that’s the problem: one of them is fascinating and one of them isn’t, and the bad one keeps muscling the good one out of screen time. The good movie is about Chazz Palminteri’s titular character, a card and dice “mechanic” (a slick operator who uses quick moves and magician-style sleight of hand) working backroom games with a crew of fellow cardsharps, dreaming of taking the house in Vegas or Atlantic City. The bad movie is about his tentative relationship with his son, who has Down Syndrome and, approaching 21, is about to be released from his care facility. The story of Joe and his crew (which also includes Linus Roache, the always-valuable Michael Lerner, and a terrific Christine Lahti) has the same kind of gritty, compelling verve as some of David Mamet’s pictures (particularly House of Games and The Spanish Prisoner). Celestino has a nice ear for dialogue—the characters speak in a jargon-heavy shorthand and are artful and inventive in their profanity. There’s a real thrill in the sequences where we watch them work a room or devise a cheat; it functions on the enjoyable, “here’s how this is done” level of a good heist film. An early scene in which Joe uses a card-cutting trick to take a hot-headed mark (played by Michael Rispoli, a familiar face from the great poker movie Rounders) at a poker game is beautifully executed; when that same mark turns up at a dice game they’re trying to work, Celestino’s writing and cutting generate real suspense. But the business with his son, Joe Jr. (Tom Guiry) simply doesn’t play, and there’s no getting around it. Everything else in the movie feels written from the inside-out; in the special features, Celestino explains how he became attracted to this scene, how he’s watched these guys work and hung out with them, and it is clearly a life that he understands and can write about honestly. The stuff with the kid has none of that honesty; it feels like a warmed-up leftover from countless other movies, and if you think it’d be too obviously derivative of Rain Man to have the kid end up helping his dad at the tables, you’d be wrong (we even get a shot of him coming down the casino escalators in his favorite suit). Palminteri does the best he can in these scenes. He’s getting older, his face growing wearier and more drawn, and he uses it well in this role, conveying his emotions with a look or a exasperated reaction more successfully than in the sometimes hackneyed dialogue. He’s always done the sensitive brute well, from his breakthrough role in A Bronx Tale forward; it’s a shame that so much of his recent work has been one-dimensional tough guys. A scene late in the film, in which he tells Lahti how he honestly feels about the kid (“He’s my punishment”) is awfully over-written, but there’s some fine acting happening there—from both of them. She’s an actress we’ve come to take for granted over the last few years (most of her recent work has been on TV) and that’s a shame; here, she skillfully inhabits the role of a woman who has grown tired of chasing the big score. In spite of the aforementioned predictable artifice, the climax, at a Vegas craps table, is tense and well-crafted. But the big resolution that follows is something of a disaster; the ongoing drama over Joe Jr.’s living situation is handled conveniently off-screen, and the final conversation between the father and son plays some pretty easy notes without much subtlety. It’s affecting, sure, but it’s manipulative as hell, and we can still be superficially moved while getting worked over by a shallow, obvious scene. When Yonkers Joe works, it works so well that you want to forgive its flaws. But the secondary storyline is so tone-deaf and warmed-over that it tries the viewer’s patience; it goes so far off-track in those scenes that it takes considerable time to pull us back in to its more engrossing narrative. There are enough good scenes and interesting performances to warrant a rental, but little more. 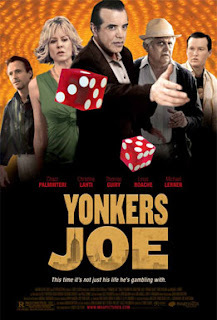 "Yonkers Joe" hits DVD Tuesday, May 19. Ebert Gets "The Girlfriend Experience"
On DVD: "True Blood (The Complete First Season)"
On DVD: "U2: A Rock Crusade"